Presented by Chris Smith, Ginny Smith. 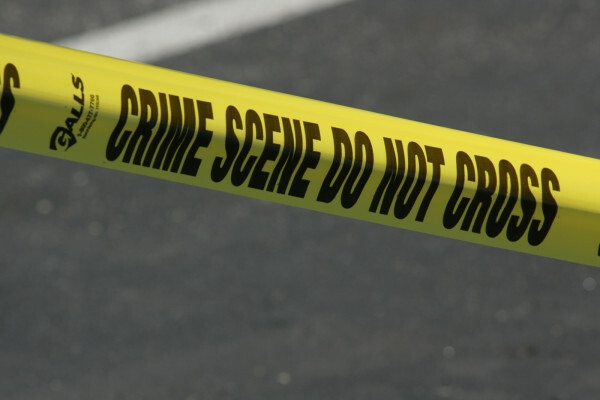 Everything at a crime scene could potentially be a piece of evidence. 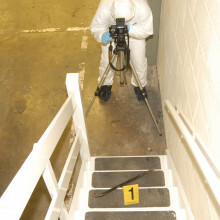 How do crime scene officers prevent contamination? Ginny - And so, our story begins. It was early this morning when the manager of the Cambridge Science Centre came upon the gruesome site now in front of us. As she entered the centre, she was surprised to notice that the door to the office, which was normally kept locked, was wide open. Crossing the room to look inside, she almost literally stumbled across the body of Mr. Wells, the centre's accountant, lying unmoving on the floor. Bending down to check his pulse, it didn't take her long to realise that the body was cold. Mr. Wells was dead. Shakily, she reached for her mobile phone to call the police. Police - Hello. You're through to the police. How can we help? Female - I just got to work. I think somebody's dead. He's on the floor. He's not breathing. Police - Okay. Are you sure he's not breathing? Have you checked? Can you see his chest rising? Female - No. He's definitely not breathing. It looks like he's been here quite a while. He's not got a pulse either and he's cold. I'm pretty sure he's dead. Police - Okay. Where are you? We'll get someone to you straightaway. Try not to touch him or anything around him, okay? Female - Yeah. I'm at the Cambridge Science Centre, the one on Jesus Lane. Police - Okay. Somebody's on their way. Stay on phone with me, okay. Chris - So, what happens when the police arrive at a crime scene? How do they protect the evidence from contamination and what actually classes as evidence? Alan Dobson is a scene of Crime Coordinator with the Bedfordshire, Cambridgeshire, and Hertfordshire Collaborative Major Crime Unit. Easy for you to say. Welcome, Alan. Thanks very much for joining us. So tell us first of all, when you arrive at a scene like our one here, what actually do you do? Alan - Well, I think the first thing that we have to ensure is that we have complete security of the scene. You'll see here already where you've placed the body, there are a number of items, which I won't discuss quite yet, because I don't want to come in to this scene prior to making sure that it is protected. There could be untold secrets here that we can look out, that we can provide evidence for. Until I have a full scenario of exactly what I believe has happened from all the people that had already been in, for example, the person finding the body, maybe paramedics. You can see here we've already put "crime scene do not enter" tape. We would have somebody on the other side of that with a crime scene log. That log will show every single person coming in and out of this scene. Quite simply, until I were to arrive with the crime scene manager, absolutely, nobody else comes in this scene. Chris - How do you stop it getting contaminated? Alan - Literally, by having police officers wherever we need to ensure that a particular area is guarded and anybody wanting to come in would have to have legitimate reason to. Until as I say, I'm there, there is no reason for anybody as long, as health and safety and fire and everybody else that may need to come in to make sure it's safe, nobody else would be allowed in. Chris - What about the people who have to go in? Alan - The people that have to go in would look like you Chris. Very nice in your white suit. Chris - I should explained. You have geared me up. I'm actually wearing some lovely booties, which have gone over my shoes and I'm wearing - well, suppose it looks a bit like I'm going to treat an Ebola victim actually. It's a white 3m suit and face mask, a hood. Alan - Indeed, yes - everything including your gloves, which would stop you contaminating my crime scene. Chris - What could I bring in with me that might contaminate your crime scene? Alan - You could bring in anything from shoe marks if you haven't got proper protection on your feet. You could bring in DNA from not having gloves on. You could bring DNA from as we speak, whilst you won't see it, saliva will leave your mouth and could contaminate a body. So, if we end up swabbing this deceased and finding some DNA, if it's yours, I'm not going to be very happy because I would suspect you're involved in the crime. Chris - Oh dear! What about the fact that people, when they commit a dastardly deed, they tend to clean up after themselves, don't they? Alan - Occasionally, depending on the type of crime scene. I mean, 31 years, I've seen basically - you name it, I've seen it. From putting chemicals all over to cleaning down thoroughly bodies even missing, to the one of domestic type assaults or murders whereby everything is left exactly as it is and somebody has probably phoned us to say, "Look, I'm sorry. I've committed this crime anyway." Where we don't have suspects, we may very well find cleaning up. But sometimes that's to our advantage. Chris - Let's think for a minute then about what we consider to be evidence. Perhaps we could ask our audience. Can we have some suggestions please - if you could raise your hand and Ginny will come to you - can you suggest to us, what would you think we would judge to be evidence in a crime scene? Who would like to start the ball rolling for us? Tim - I'm Tim, footprints. Ailish - Hi, I'm Ailish. I would say blood samples or saliva. Frez - I'm Frez and I think a weapon. Female - You'd find a body sometimes. Chris - You may even find a body and there's one more over here. Ciana - Ciana, a broken window. Chris - These are all good suggestions, Alan. Anything that people are missing that are obvious choices? Alan - Within this scene itself, I would say everything that has been said is absolutely perfectly right - points of entry, how has somebody got in, has this person actually been murdered, do we know that yet? It's very easy for us at the moment to suspect that but is it somebody that's maybe committed suicide? Is it somebody who's maybe eaten something? Is it a natural cause? We don't know yet. What we would do is treat this as a crime scene. Now looking at this to start with, if I described a scene too on the crime scene side of the tape, we have the deceased lying face down. We have a laptop computer, which appears to be under his right arm and towards his left arm, not gripping but still stood up in the position, is a flask with the lid off. So initially, we're looking at possibly, what's on the laptop. Now under new forensics, we will have to send that off. It's not something that I would look at here. But prior to doing anything with that, we maybe need to look at DNA. We'd need to look at fingerprints. So we would swab it. We would - what we call - gel lift which is a particular way of taking fingerprints. And really quite soon, we'd get that from our crime scene to a lab for our techy experts to look into it and see what he's been looking at, what's he been dealing with. Bear in mind, this is a man who's dealing with money and the accounts of the university. Is that something that might be in this? Is there a fraud going on? We just don't know. So, we have to presume the worst. For me, that's a really essential piece of getting that done at the scene, to get away, to see what we've got. Really, the next part for me is the flask. What's he been doing? Has he been drinking from it? Could it be toxic? Is there something I need to be worry about? If it is toxicology we're looking at, clearly, that's not my remit here. I know we'll come on to that later but I would need to let the pathologist know that I've got a flask, I don't know what's in it yet. That will go to the chemical experts to tell me what we've got. Finally, we've got of course the whole body. Let's have a look at it. Is there anything else there that we may be missing? We need to look under the clothing. Could there be stabbed wounds? Could there be bruising? Could there be DNA on the fingers? Fingerprints - yes, that was mentioned. What about hairs? Maybe he's fought somebody. There could be somebody else's hairs within his nails. There's a whole remit. If I'm being honest with you, looking at this scene that we have here, I would estimate two scenes of crime offices probably the best part of 4 to 6 hours before they even start moving that body, to get the best forensics from where we are at this time. Chris - Do you take sort of video footage of yourself going through a scene these days or is it just static photographs? Alan - No. We do 3 things now. One is, normal photography, one is video and one is what we call R2S which is Return To Scene. It's a 3D spherical system that we would put footplates in anyway on our scene. That will enable anything that's under there that we don't know yet it's there because maybe some chemical treatment would bring fingerprints up on a floor like this. So because we don't know what's there, we would protect it by using footplates. The R2S, the Return To Scene photography system would then sit on top of that. We do a whole spherical. We can add things to that then so I can add evidence. We can eventually put the hard copy of photos into that to put the body to the scene. We could do the computer to show where exactly that was. As the forensic evidence comes to us, we can then start inputting that bit of evidence. So eventually, that will give you a whole scene. That may take several weeks, several months when toxicology comes back in but it will give you the whole picture, which we do ultimately need to show to a jury to prove or disprove that somebody has committed a crime. 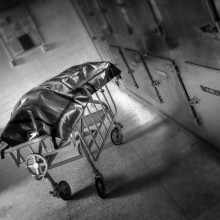 Forensic pathologists are tasked with determining how someone has died. How do they go about getting this information from the body? Chris - So, what would actually happen when our gentleman down here who's our victim turns up in the post mortem lab? What's the process? What do you do? Jocelyn - The most important thing would be that we could identify the body. So, we could ensure that it's the same one from the crime scene that's actually arrived in our mortuary. This is important because we need to be able to trace it. We need to know who's had access to him and who could obviously have planted evidence along the way onto the body itself. Chris - So, you get him on the slab. What do you look for? I know I said that you look for external signs of things, but what sorts of things can you pick up by just looking at someone from the surface? Jocelyn - We can get a lot of information by doing a visual examination of the body. The clothing would then be taken and exhibited separately. And then we would start to actually look at the body itself. We would look for things like bruising, defence wounds on the forearms, defence wounds seen on the hand, on the palms of the hands, if somebody's been attacked by a knife, bruising around the head. So, all those sorts of things would be important for us to take account of during our examination. Chris - Can you also get some idea as to how long someone's been dead because when you watch telly programmes and the detective always says, "When was the time of death?" And this person gives a prediction almost to the nanosecond on telly, don't they? I mean, it's obviously not as accurate as that, is it? Jocelyn - There are guides for us to be able to tell how long a person has been dead. We can look at the amount of decay if they've been dead quite a long time. We can also look at things like rigor mortis which sets in over certain periods and then wears off again. So, that enables us to pinpoint time of death. Chris - So, the person goes a bit stiff and then they soften up. So, if they're still stiff, you know that they've died sooner rather than later. Jocelyn - Yes, they actually go very stiff and that will wear off over time. So, we've got a fair idea then of the timeframe that we're talking about. Chris - What about simple things like just taking the temperature because obviously, we're a big bag of water, aren't we? So, it does take quite a while for a human to cool down. Jocelyn - Yes. It very much depends on the situation that they're found in and the temperature of their surrounding areas. So for example, we would see advanced decomposition in somebody in a flat where the heating have been left on quite high. They wouldn't have necessarily been dead for as long as we would have expected. The rate of decomposition would be much, much faster. Chris - What about telling if our victim had been moved? Can you tell that by looking at them externally? Jocelyn - Yes. Again, we can pick up a lot of information about whether they've been moved, what they've been leaning on, the way that the blood pools in certain areas, where there's been a lot of pressure. So for example, if somebody is laying on a mat with some indentation in it or something like that. Quite often, you can actually see that where the blood is pooled onto the body. You can actually pick up the patterns. So, it's very important to have a really good visual examination of the body. Chris - What about when you get inside? Jocelyn - Okay, so after we've made the visual examination of the outside of the body, we would then consider the internal organs. As an example, what we've got here in this tray, we have - it's actually a pig pluck - we're using a pig for this. Chris - I'm relieved because there is sitting in front of us, on this very large black tray, a whole load of what I would call the offal group of organs. I was wondering where you've got them from because knowing as I do a human pathology then they look pretty similar. Jocelyn - Yes. This is actually what we call a pig pluck. So, it consists of the lungs, the trachea, the oesophagus, the liver, kidney, and heart. And can buy them from a butcher, they will come all in one piece. You can buy them and we've dissected this one out slightly so that we can have a look at their separate organs. Chris - They taste great in haggis. So, if you were actually to be faced with the remains of the internal organs of our victim, how would you then approach looking at these organs? What are you looking for? Jocelyn - Well, in this particular case, we obviously don't know yet how he's died, the cause of death. So, we would be looking at maybe the pathology because there's no obvious signs of death. So, we'd be looking at pathology, we'd examine the heart, see if there's any signs of a heart attack. We'd look at the lungs to see if there was congestion. Yeah, we'd have a good look around all the internal organs and see how normal they look. Obviously, these all look fairly normal, but there would be signs if there was a heart attack. There would be signs in the heart muscle that the blood had been deprived in a dead area of muscles so it would be obvious to us. Chris - If our man had been poisoned, how might that show because obviously, I can understand, if you've had a heart attack, you might see a blood clot in a coronary vessel for example and as you say, bits of dead muscle. But how would say, the organs be affected by poisoning? Jocelyn - It very much depends how somebody has been poisoned. How it was ingested, if they ingested it, you could find evidence of irritation in the trachea, you could find evidence of irritation in the intestines, lungs, liver damage if it was over a long time. so, it very much depends on how the poison was actually taken into the body. Chris - And therefore, which organ gets hit the hardest. Chris - You've got some little pieces cut-off here. Is that because when you did the sort of gross examination of the organs, you then take some smaller samples for further examination? Jocelyn - Yes. So, when we have a look, what we would do is remove the sample, remove the organs here and we could bread slice them and actually have a look at the cut surfaces all the way through to identify any areas of damage. Chris - We're looking at the lung here and you cut the lung into sort of 1 centimetre wide lumps. Jocelyn - Yes. That's so we can have a look all the way through it and we would do exactly the same with the heart. We'd open up the heart and have a look at the walls, the ventricles, the atria, and have a look all the way around to see what sort of damage there was. So, if for example somebody had been stabbed then we might see damage in the lungs or in the heart, the evidence of the stab wound. Chris - How do you actually record your findings? Do you have to take photographs so that when Alan needs his evidence, you're able to show him the physical pictures of what this person look like inside to account for their death? Jocelyn - Yes. We would take photographs of anything that we found and also, there would be a report constructed of everything that we found, so yeah. Chris - So, let's turn one of our audience into an amateur pathologist. What's your name? Chris - Nicole, you've suited and booted. That's lovely and you've got purple gloves on. That's terrific! So, what would you like to find out about first? Nicole - Let's have a go at the heart. It's quite dense. It's quite heavy. Chris - How much do you think that weighs? Nicole - A couple of pounds? Jocelyn - She's probably about right. Yes, it's a small but very, very dense, very heavy organ, yeah. Nicole - Compact muscle and you can see the different compartments as well quite nicely, I guess. Jocelyn - So, we've got the atria here at the top and then we've got the ventricle lower down. Obviously, it's very dense because it's designed to pump the blood around the body, so it has to be very strong to be able to do that. Nicole - So, this would be the same size as a human heart approximately? Jocelyn - Slightly bigger than that, but yeah. Chris - What else can you see there, Nicole? Nicole - So, these are the lungs. Chris - Is that what you expected a lung to look like? Nicole - Well obviously, it's chopped up so I would hope my lungs wouldn't look chopped up. But it's very light. It's a lot lighter than I thought they would look, a lot less dense muscle. Yeah, I guess I would imagine the lungs to look a bit like this as a whole. Jocelyn - It's a lot lighter because it's full of air. So essentially, it's just lots and lots of very tiny balloons with very fine membranes because it's obviously involved in gas's exchange. So, they are very light. They're much bigger than the heart but they're much, much lighter because they're full of air. Nicole - Yeah, very squidgy. Chris - Thank you very much, Nicole. Give Nicole a round of applause please. What about if you do all these and you think, "Well, to all intents and purposes, these organs look pretty normal and I can't see any signs of trauma." What do you do next? Jocelyn - In the case of our young man down here, what we would do is we would submit blood samples to the laboratory and also the stomach contents to the laboratory as well so it would go off and be dealt with separately away from the mortuary. 20:36 - What's your poison? 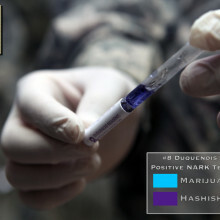 Testing for drugs and toxins in the body is vital to a solving whole host of crimes. Chris - So, what sorts of chemicals can you detect? Sarah - All kinds of things - natural products, obviously, more synthetic drugs, all kinds, yeah. Chris - And how do you go about doing that normally? Sarah - Well, we first do preliminary tests which tend to be colour tests that give you a positive ID, more about the class of the drug rather than a specific drug. Chris - So, when you say a colour test, are you saying you literally take a sample from a person and you mix it with something and if a chemical is there, a drug is there, it will produce a colour that you can see? Sarah - Yes, it will, yeah. Chris - How does that work? Sarah - There's different reactions. There's lots of different tests, but it involves a fair amount of sort of complex chemistry. But the idea of them is they work quite fast. You can do it at a scene in situ and they give a bright colour very quickly. So, it's very obvious if you get positive. Chris - So, what sorts of specimens you can test? Sarah - We can test urine, we can test blood, we can even test hair. Hair is quite good because it gives us a sort of longer timeframe to looking at maybe the victim themselves or maybe abuse of drugs, etc. Chris - How does that work? How does the hair end up being useful? Sarah - There are certain chemicals in your hair that allow things to be trapped in it and they sort of bond quite tightly. So, they remain in your hair for a long time. Chris - The chemical would therefore go around in your bloodstream and because the hair is growing inside your body and then coming out, the drug in your bloodstream gets incorporated inside the hair. Is that what you're saying and you can pick that up? Sarah - Yeah, that's correct, Chris. Yes, we can. Chris - Can you tell roughly how much someone has been using a drug? Sarah - Yes, we can. We can quantify it, yeah. Chris - Wow! Shall we have a go? Have you got anything you can show us? Sarah - I've got some little coloured tests to have a look and if somebody wants to come and have a look at it, they are most welcome. Chris - What's your name? Chris - While Milly gets her gloves on, just talk us through please Sarah what we've got here. So, you have got a little china plate with lots of little indentations in it, little wells and a big box with - it says there's some dangerous drugs in here. So, what are we going to do? Sarah - Well, the first test is a test that can be used in a crime scene straightway. So, you don't need to be a chemist to do this sort of thing. it's just a glass ampoule that's got a specific reagent in that reacts to certain classes of drugs. Chris - Which drugs are you going to look for? Sarah - We're looking for opiates. So, I've got an opiate with me. So, let's see if we get a nice colour change. Chris - Do you want to test any of the audience? Sarah - No, I better not. Chris - Sure, you would find nothing. So, you are taking out from the box, you've got a little ampoule there. This is the reagents, the thing that's going to react with the drug molecules if they're there. Sarah - I'm just going to find myself a pipette. Chris - There's a little glass pipette to draw up. Sarah - And a little spatula because you don't need much. A really small amount gives you a really good colour change which is why they're very good tests. Chris - Okay, so we're going to mix some of - you've brought along obviously some opiate chemicals to show us that this actually works. Sarah - So, we've got a glass ampoule and you see it's got reagents. Can you see the solid in it, Milly? Sarah - So, what you do is you break the top off, put a small amount of powder but you could also put a liquid in. Put the top on, give it a shake and you should get a nice purple colour. Chris - Okay, let's have a go. So, at the moment, this ampoule has just got clear colourless fluid in it. That's the top coming off the glass ampoule and you've got your pot of opiate and there's a policeman. Do you know there's a policeman here? Sarah - I do. I'm keeping quiet. Chris - Wow! That really is a very tiny amount you've put in. Literally, a couple of grains of the agent. Sarah - Yeah, milligrams. You hardly need any. Chris - So, we're going to shake that up. Sarah - You should start seeing a purple colour coming through..
Chris - Tell us what you're seeing, Milly. Milly - At the bottom the bubbles are turning purple. Chris - A very bright purple. Sarah - So, it's a very bright purple. So, that tells me there's an opiate there. Chris - How sensitive is this? How much can you pick up? Sarah - They are quite sensitive but the actual instrument techniques that we use are very sensitive too. But they have to be sensitive because most street drugs are very dilute. They're diluted with some really nasty dilutants and all kinds of things. so yeah, they have to be quite sensitive. Chris - Thank you very much, Milly. Do have a seat. If you used that at the scene of the crime, that would give you an indication of what was going on. But it obviously wouldn't tell you exactly what the agent was. It would tell you it was just a class of agent like an opiate or something. But you'd like to probably know more accurately what it was. So, what can you do to get a more accurate chemical diagnosis of what's going on? Sarah - Well, so we do analytical tests. So, the most techniques that we use in forensic science tend to be chromatography techniques because most drugs are fairly complex. There's a lot of things in street drugs. So, you try and separate everything out. So we're able to just look at the thing you're interested in which is what the chromatography does. Chris - How does that work? what is chromatography? Sarah - Well, it's just separation. So, I've got some pictures to show you actually if you want to see them. Chris - That will be good for the radio. Sarah - What we call a chromatogram because it's chromatography. Chris - It looks like a graph effectively. There are lots of little peaks, like little teeth in a shark's mouth actually. So, what are those little peaks? Sarah - Well these, this is a chromatogram of petrol. There's over 200 components in petrol so we need to separate them all out before we can identify all the individual components. Chris - I see. So, you would feed a sample into the machine and it breaks it up into all of the individual components so you can see when someone has been exposed to something, you won't just say, "It's opiates." You'll know all the different chemicals that are in there. Sarah - Yes and we have a detector on it which is a really good detector. It's called mass spectrometry but basically, how I understand it, it's like getting a hammer and smashing a molecule apart. And how the molecule breaks apart is indicative to that molecule. Only certain molecules break in certain ways. If we know that, we can then do a positive identification. Chris - Does that mean you could for instance, if you had a sample of some drugs in an environment and you had a sample from the person, you'd be able to marry up almost the chemical profile in the drugs and environment with the chemical profile from the person and prove that one led to the other. Sarah - Yes. We don't just look for the drug. We look for everything else that's there too and it enables you to do that through chromatography. Chris - What sorts of things can one probe? It's not just illegal drugs you could look for. What else could you look for with these sorts of techniques? Sarah - The fair amount of ignitable liquid. So, accelerant analysis is a good one, fire debris analysis. Chris - So, if it wasn't something that was routine chemical that had killed our victim but it was something a little bit more unusual, you could still find the molecule. Sarah - We could. It would take a bit longer because it would be like looking for a needle in a haystack a little bit, but yeah, we could. Chris - Because it would stand out as one of those peaks because it wouldn't normally be in the body and you'd see something that was there that shouldn't be. 27:53 - Can you trust your memory? Our memories are not like a video recorder, they are often unreliable and easily influenced. How does this affect an criminal investigation? If you were asked what you were doing during a 45 minute period on Saturday afternoon 3 weeks ago, how much would you remember? Unless there was something special happening, for example your birthday, you probably won't remember much. Cambridge University's Jon Simons explains to Chris Smith why our memories are not like taking a video of our experiences that we can replay and how this can affect criminal investigations. Chris - How does memory actually work? How does my brain store a memory of what I've been doing, where I've been, what I've done? Jon - Everything that we experience, everything that we witness is registered in the brain to some degree. But it's only really if we're aware that something is important that we'll process it further and pay attention to it, and then that information can then be processed in further parts of the brain. Chris - What actually physically is a memory? Jon - A memory is a set of neural processes that occur that contain the features of an experienced event so for example, the things that we've seen, the things that we've heard, smells, perhaps our thoughts and reactions when we experienced the event as well. And generally, this is represented in various different parts of the brain. So, there are bits of the brain towards the back for example that process visual information, parts of the brain around the ears that process auditory information for example. And we store those features there. And then when we're trying to remember an event, we use a bit called the hippocampus which is towards the middle of the brain. That is involved in bringing together all these different features and kind of binding them together into a single memory so we're able to relive a previous experience as it unfolded. Chris - Is it a bit like then if I go to the library and I want to know - this is in the good old days, not so much now. You go to the library and you say, "I want to know where book X is" and they've got a sort of card file system and you flick through the card file and it tells you which part of the shelf you will find the book you're looking for is a part of your brain like the card file and it routes your request for the memory to the part of the brain that stores that particular recollection. Jon - That's what people think the hippocampus is probably doing. So, this is a region that's very much a kind of card file system. It's something that enables you to know where these different aspects of a memory might be stored and to be able to hopefully retrieve them reliably later on. Chris - Now, the crux of this is, how accurate are those memories? Jon - Memories vary in terms of accuracy. For one thing, if somebody is aware that something they're experiencing is important, then they might attend to it more closely. They might think about it more deeply and that's likely to lead to a more reliable memory later on. But then we know that as you said, memory is not about retrieving a video tape and replaying it. We would to think of it as a reconstructive process at the time of retrieval. So, at the time that we're trying to remember something, we go in and we try and retrieve those various small aspects of memory - a visual image or a sound or something. And we try to reconstruct that into a memory at the time of retrieval and therefore, the way in which we remember can be very much influenced by our expectations or our biases or our thoughts at the time of retrieval. Chris - Well, they say a story always improves with the telling. So, the more you run over something in your mind, can you almost begin to persuade yourself that something that maybe wasn't true or wasn't there is true and was there? Jon - Absolutely and that's a real problem of course for eye-witness testimony in that we have to be very careful when people are interviewing witnesses for example, not to introduce other information for example by some kind of a leading question that might influence their memory. And then as that is retrieved at multiple times, that can strengthen that memory and it can become a very, very confident memory and absolute, you know, short recollection that is, "I definitely did see that event in the way that is based on that leading question." Chris - Actually, could it be that we're biasing our witnesses by the way we ask them questions and ask them to recall information in the environment in which we get them to do that recall in a stressful court. They could actually be remembering or misremembering what's going on. Jon - Absolutely and this is something that has been a very big concern for quite a long time. now, police officers are trained to be very careful about these sort of things, be very careful about the way in which they question witnesses. And also, in court situations, lawyers and judges have to be very careful in the way that they would cross examine a witness for example to make sure that they're not biasing the way in which the witness remembers a previous event. Chris - Is there anything practical we could do with this audience to convince them of how easy this is to do? Jon - Absolutely. So, what we've got is a list of words we're going to try to get our audience to remember. I need a volunteer from the audience who has a very clear handwriting preferably. Chris - How old are you? Chris - You have immaculate handwriting we're told. Chris - We're going to find out. Jon - Okay, so what I'm going to ask you to do, I'm going to read out 15 words, a list of words. I want you just to write them on that piece of paper that's in front of you. Audience, I want you to try to remember these 15 words. I'm going to be testing your memory a little bit later on. Door, glass, pane, shade, ledge, sill, house, open, curtain, frame, view, breeze, sash, screen, shutter. Don't show the words to the audience for the moment. What we're going to do is test your memory for those words. So, what I'm going to do is I'm going to read you out some words and if you think that word was present on the list, I want you to shout, yes! Door. Was door present on the list? Chris - A quite convincing yes. Jon - What about the word 'banana'? Jon - Pretty unanimous no there. What about the word 'window'? Jon - Very good. So, we've got some very good potential witnesses here, but I think probably - what do you think? 50% of the audience said yes to 'window'? there was certainly a gentleman at the front here who said no pretty quickly, so he'd make an excellent witness. So, what this shows is that even a word that wasn't on the list, most people can think and often can be very confident it was present. The reason for that is of course because all the words on the list related in some way to the word 'window'. And so, over those repeated instantiations of words that meant something to do with window then you find that you have this expectation that window must've been on that list. And so, most people are going to falsely remember the word 'window'. Chris - So, we just prove to audience - Ciana, can you just hold up your list of words and you will see the word 'window' isn't there. How many people actually genuinely thought - just hold your hands up - who thought that the word 'window' was on the list you'd heard? More than half the audience thought that they'd heard the word 'window' and it's clearly not one that Ciana wrote down. Thank you very much. Give her a round of applause. What about the whole process of forgetting because there was a bit of research just been published showing that actually, when you recall one memory, this can make you actively forget another one? So, by asking people to dwell on just one set of what the police might think are relevant facts in a case now, in fact, they may be deleting from their memory other salient information that they want to later rely on in court but then it's gone. Jon - When you remember something you actively supress competing or interfering memories that are similar to that memory. This can be a very useful function because it means that when we really want to remember something, we've got a better chance being able to remember that thing in the future and not sort of have our memory made unreliable by interfering competing kinds of information. But it does mean that if you're repeatedly questioned about the same thing over and over and over again, you're going to be less likely to be able to remember some other facts about that crime that might later actually be really useful bits of information that would've been useful to the police. Chris - People here, what could they do, what can anyone of us do to make sure that we don't fall prey to misremembering things in the way that you've demonstrated that more than half of us do? Jon - Well, it's very difficult. As we showed, it's a very difficult effect to - even if you know that this effect is present, it's something that's very difficult for us to avoid falling prey to. So, the only thing you can really do are to pay close attention to things you want to remember. If there's something you're really interested in remembering, thinking about it deeply, thinking about it again, with associated information, things that you know that for example, the person that you saw doing a crime might look like someone else you know for example. It might be useful strategy. Those sorts of things, relating it to other things you know are going to be useful. But also, write it down as soon as you can. 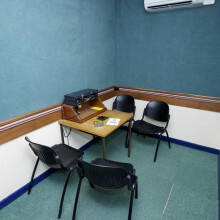 If you think you've witnessed a crime and you might not be questioned for a long time, write down all the information that you can remember straightway because that's more likely to be accurate and reliable than something you might tell someone in a few hours' time. David - When people came in this evening, we asked them to record their house number and I think those all went on to the computer. But when we look at the first digit of each of these house numbers, so that would be 11 88 4444, one here, let's look at what pattern those digits form. Okay, what we see among the house numbers is that out of 25 numbers, 11 of them started with a 1. Three of them began with a 2, two began with a 3, four began with a 4, and then just 5 began with an 8. If we look at that, we got a little graph here that shows this distribution of the first digit of the house numbers and it clearly is not equally spread between 1 and 9. There's a great preponderance for low numbers to start up in particular, for number 1. And that's an example - a very rough example of what's called Benford's Law. Benford's Law says that numbers of many quantities are not randomly distributed. If we took the lengths of river, if we took how much people earn, if we took the number of books in libraries, we took the number of people living in cities and looked at the first digit of each of those numbers, and plotted them out in a graph like this, they would all have a similar pattern with the most common number starting with 1. In fact, 30% of all numbers begin with 1. Isn't that extraordinary? And 18% begin with 2 and so on, and so on. In fact, 13% begin with 3 and it goes down and down, and down. And that distribution of numbers just occurs again and again, and again. Chris - And that's known as Benford's Law. So, if one were to take any natural phenomenon including accountant's records then one should see that pattern present there. David - You've got to have numbers that cover a very wide range. If just asked you your height in feet, then most of you will give me 4, 5, or 6, or something like that. So, that wouldn't work at all. They got to be something with a really big spread of numbers such as lengths of rivers. In fact, it's just quite remarkable with houses quite so well. So that was lucky. 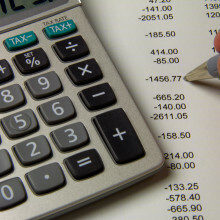 But for accounts or numbers in where you might have very small numbers or very large amounts, it works brilliantly and Benford's Law is used as a tool to detect people fiddling accounts. Chris - Why should it be useful for detecting people with fiddled accounts because wouldn't they just know that? David - Well, it's quite difficult to reconstruct figures that obey Benford's Law. Chris - What you're saying is, when people fiddle the books, they try to choose numbers that they think look plausible but in fact, they're not. David - And the classical example of that was when people looked at the Greek national accountants for 2000 when they were under a lot of scrutiny and they were putting in for EU monitors. In 2008 for example, they looked at all the numbers in the Greek national accounts and 34% of them began with a 2 which has almost double the amount they should. It should only be 18% that begin with a 2. And that was considered clear evidence that people were essentially making up the figures. Let's think there were lots of numbers in the accounts and they were in pounds, and I wanted to translate them into another unit say, dollars. Let's pretend there's $2 to the pound. All those numbers would double. Now, if actually, numbers didn't obey this law and there were equal numbers in those accounts beginning with 1, 2, 3, 4, 5, 6, 7,8, 9, you realise all the numbers, the amounts that started with a 5 to a 9, when you double them, change them into dollars. We'd all now begin with a 1. So, you get a completely different distribution coming out just by changing the currency. You get a completely different distribution. But if the numbers obey Benford's Law, you can change the currency and they still obeyed Benford's Law. That's where the mathematical form for Benford's Law comes from, so what's called an invariant distribution. You can change the units, you can change lengths of rivers from miles to kilometres to inches, and they will still all obey Benford's Law. It's an absolutely beautiful bit of mathematics. Chris - And the police do actually use this. David - This is used for forensic accounting work, yes. Chris - The clincher though, why does this apply? Why does that happen? David - Ah! That's a really difficult thing to say. That's why the usual way to explain this say, well if it didn't, you'd end up with when you change currencies. You would end up with different distributions. It's almost like saying, "If it is going to have a distribution, it must obey Benford's Law." That's not a very good answer, is it? Chris - I'll ask a question again. So, why does this apply? Why do we see this? David - You see, it's a natural way that numbers cluster. You don't have to work away all through the 1s before you get to the 2s. So, if you think of the length of the street then you get them up to a hundred. But then for the next big jump of length of streets, all are going to begin with a hundred. And so, street is not equally likely to be half a mile as long as 100 miles long. Chris - So, there are more things that are in small numbers than there things that are in big numbers and therefore, the small numbers starting with 1 for example are going to crop up more often. David - I guess you could say that. Chris - Let's just describe what we're seeing here. You have this gentleman who is wearing his everyday clothes but strapped onto him are orange boxes - one in the middle underneath his neck, one on the top of each arm, one on each wrist, one on each hand, on his feet, knees. What's in these boxes? Sophie - These are called inertial sensors and what they basically do is together, they send a 3D image of how he looks like. As you can see here on the screen, he looks like a skeleton man via these receivers to the laptop. Chris - So, this gadgetry that he's wearing is beaming movements that are being picked up by these orange boxes back to your laptop and it's then superimposing those movements onto this mannequin that we're seeing on the screen behind us. Sophie - Yes, that's correct. Chris - Well, let's see this in action then Sophie. So, what we've got, we've put Nick on our virtual dancefloor. Projected onto a very large screen behind us is a mannequin like you would draw in art classes which is showing all the bits of his body. Tell us what we're actually seeing projected here. Sophie - Yeah. Well, you can see a skeleton man. You can see that you have 17 sensors on your body. So, what this sort of does is it transmits all the information about where he is in the room and where every sensor is as opposed to all the other sensors. So, that's global and local position. And together, that sort of gives us an image of the skeleton man in a 3D space. If you would be working in Hollywood, you would not be really interested in the skeleton man. You want to see Gollum up here. so okay, we now know how it looks like in person, we now know how it looks like on the screen, sort of a skeleton that moves around with 5 green dots. The question of course now is, how well can you dance? Okay, wow, very well. Okay, like a Saturday Night Fever is happening right here. Very impressive. Are you guys proud of your father? Maybe we should ask how your children are feeling right now. Male - Yeah, he likes going on the stage quite a lot. Sophie - Wow! Do you recognise him in here? Male - Not really. He looks like in a film where they'd put maybe a Spiderman suit on him and he could fly. Sophie - Wow! So I think you're your son's new hero. Okay, well thank you very much. Chris - So, how is this going to flush out if this bloke did the deed? Sophie - We did some experimental research where we had a lot of different suspects stealing some money and we found that people who actually stole the money moved about twice as much as people who didn't. Chris - They were literally kind of a bit anxious dancing on the spot, were they? Chris - What sorts of movements? Sophie - It was actually very consistent across all the body parts so for the head, the arms, the trunk and the legs. For example, when we were talking during the interview about one of the two tasks, the people who were lying literally moved twice as much than the people who were telling the truth. And it was about 12 cm per second over their entire body. Chris - Is this just more stereotypical things like crossing and uncrossing your legs, shrugging your shoulders or is it more subtle fine movements that you wouldn't necessarily pick up on? Sophie - It's any type of movement and I think this is why we've been finding these results. 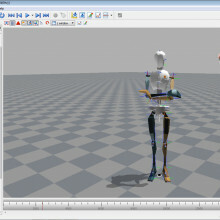 So far, most psychologists have actually looked at movements by coding video data. Whenever you code, you usually say, "Did someone move his right hand, yes or no?" but you don't include how big this movement is and you also don't take into account all the small movements people make all the time. so, we thought, what if we literally move every millimetre that people move around. If we measured that and then see how much people actually move because that's been a very big question in deception research for decades. Chris - The idea then, you would bring in the possible perpetrator, wire them up like this, and what do you do? Do you just observe them when you're just talking to them and ask them random questions - how old they are, where they live and that kind of thing where they're not lying and then compare the number of movements then with the number of movements when you then start probing them about the crime? I mean, how do you establish a baseline for what's normal for them? How do you know if someone isn't just very jittery? Sophie - So, what you've just been describing is what happens with the polygraph. I have to say because we've only done a first few sets of experiments. We haven't actually tried to figure out how we can maximise our results on an individual level. So, what type of questions to ask is something we're actually going to investigate over the next couple of months. So, what you've been describing definitely works. I don't know if it works for this technique or maybe we have to do something else. Chris - Would this be practical in a crime detection situation? Do you bring all your suspects in and make them look like this gentleman? What's your name by the way? Chris - Did you expect this Nick when you turned up here this evening? Nick - Not exactly, but it's very fashionable. Chris - He looks pretty good. Certainly, a talking point would be a conversation start or a party wouldn't it? But is this how you'd see this being used? Sophie - No. this is an inertial system that works with sensors. But of course, if you ever want to use this in practice, you can't actually ask a suspect to put the suit on because A. no one want to and B. it takes a lot of time. So, what we're currently doing in the lab here in Cambridge is investigating if there's any alternative way of measuring movement without having to sort of touch someone so unobtrusively. We got some equipment from all kinds of BA, the army. We have radars, we have time of flight cameras and we're now creating one big test. We're to find out how else we can measure movements. Chris - Literally, watch what a person does and use a computer to log that rather than wire them up in this way. And then they wouldn't even know that they're being effectively monitored, would they? Chris - But returning to my point, if someone is just nervous because they've got someone grilling them, like Alan is a bit "blokey," he looks pretty scary. If he's grilling someone, how do you dissect away the nervous effects of them being grilled by a police officer from just the fact that they're telling porkies? Sophie - I hope that with our technology, that actually isn't an issue because we've been finding that although anxiety might affect how someone behaves, that's not what's causing the difference between truth tellers and liars. But it is one of the main criticisms about using the polygraph where you're comparing sort of control questions with critical or target questions that of course, they're quite good at detecting deception because whenever you're lying, you usually get a bit more anxious. But then some people who are actually innocent can become very anxious as well because someone is just asking you about if you've murdered this person. So any normal person will get a bit sort of anxious about that. So that actually is a problem. But because our movements were not actually caused by anxiety, I'm hoping that we can protect innocent people by using this method. Chris - Could I train myself not to move more often so I could become really good at lying? Sophie - So, with non-verbal cues to deception, behavioural control is definitely one of the things that makes our job very difficult because some people might find it very hard to lie and experience a lot of cognitive loads whilst other people get a bit more emotional or anxious. But some people can sort of step over that and control their behaviour and they'll try to appear as honest as they can. We haven't tried it yet with this suit, but one of the benefits of getting some media attention is that I actually have newspaper articles about a research. So, one of the things I want to do next - but anyone who will be my participant, please don't listen - is, give half the participants the newspaper article about a research that says that liars move more and the other half, we won't give this newspaper article and then see what they do because I think what they will do is try to sort of beat the system and I think that they'll try to move less. But now, the question is, if we can detect if then liars moving less as a countermeasure differs from actual truth-telling behaviour. So we were hoping to create a software that gives sort of a greenlight for whenever someone seems to be telling the truth, a red light for whenever they seem to be lying and then sort of an orange amber for whenever they're a bit suspicious because they're moving way too much or way too little to sort of fit the system so, that means you need to keep talking. Chris - What do the police tell you about this? Do they seem enthusiastic or are they a bit sceptical or wouldn't they tell you the truth? Next Why do we get goosebumps?